Nov. 28, 2018: In 2012, Bronxville native Harrison Bader graduated from Horace Mann and headed to the University of Florida as a baseball recruit with high hopes for the future but not knowing what lay ahead. Three years later, after his junior year at Florida, Bader’s lifelong dream of playing professional baseball was realized when he was drafted by the St. Louis Cardinals in the third round of the Major League draft. Bader's baseball career began with Eastchester Little League and then onto Horace Mann and the New York Grays summer travel team. 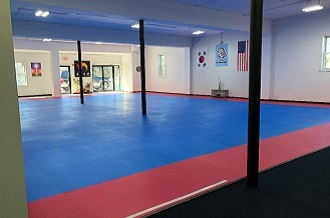 He also spent hours practicing with his dad, who, along with his mom, was hugely important to his success. "My dad would find the time to pitch to me after work no matter how tired he may have been," said Bader. "Oftentimes he would purposely hit me while pitching to me and I would question why. He would say if I was going to be a Major Leaguer I was going to get hit and I would have to be tough and this would prepare me. He would say, 'You may not like it now, but you will thank me someday,' and I certainly have!" Harrison's mom, Janice Baio Bader, also provides guidance to her son. "I think I provide the softer and more sensitive touch to the equation," said Janice. "I stress the importance of gratitude and kindness." Harrison also attended many sporting events with his mom when he was young. Harrison's sister, Sasha, is also one of his biggest fans. "I am so proud of my brother and he is the best big brother anyone could have," she said. Looking back on his first full year in the Majors, Bader said, "Like most things in life, to succeed it's a process to get to where you want to be. Each step of hard work along the way is a building block that prepares you for the next step or level. It does not happen overnight. And you have to have patience, confidence in your abilities, and a great support system." During the off-season, which is from late October to late February, Harrison plans to spend time with family and friends and focus on working out, getting physically stronger, and refining his hitting with the goal of "being ready to have a breakout 2019." Finally, for young players who have the dream of playing in the Major Leagues, Harrison offered this piece of advice, "Find your passion and devote yourself to it and see where it takes you." 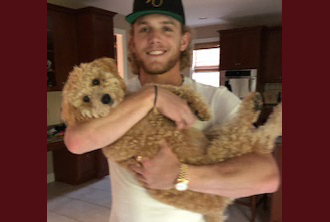 Pictured here: Harrison Bader with the family puppy, Riley.